If you aren’t in the habit of visiting Klout on a regular basis, you can create an e-mail alert for Perks. It can be difficult to keep track of everything you have going on in the social media world; this can help simplify your social media management. When you are eligible for a Perk and you have set up your notificationscorrectly, Klout will e-mail you and let you know. However, although you will receive e-mails on occasion alerting you to current Perks, some may slip through the cracks, so it is recommended that you still visit Klout regularly. Log in to your Klout account by pointing your browser to klout.com and signing in with either Facebook or Twitter. Mouse over your name in the upper-right corner and choose Settings from the list that appears. 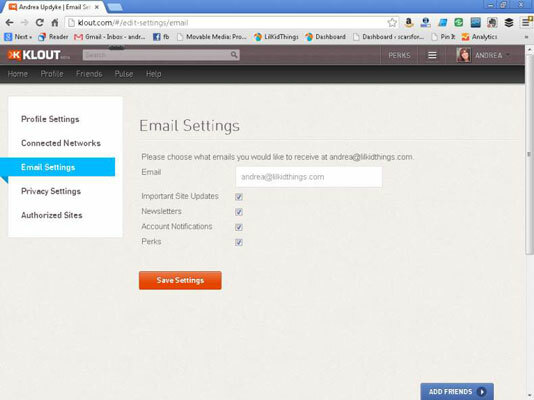 Click Email Settings in the sidebar. Select your e-mail preferences. To receive e-mail notifications, select the check box next to the Klout Perks heading at the bottom of the page. If you don’t wish to receive e-mail notifications, leave the box deselected. You will now receive an e-mail notification when you are eligible for a great perk!